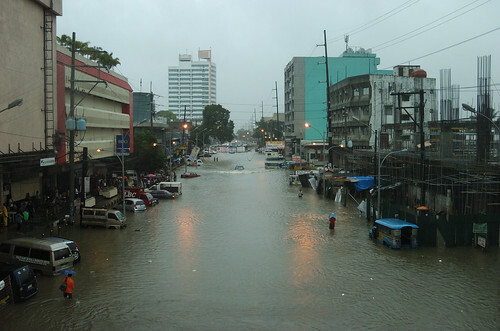 Filipinos now need all the help they can get, especially those hit hardest by rampaging tropical storm Ondoy (international code name Ketsana). The storm made landfall yesterday in Luzon, bringing endless rains and spawning huge floods in Metro Manila and many parts of Luzon. 心 Donate directly to the Red Cross. 心 And most importantly, we need everyone's PRAYERS. Spread the word? Repost or link to this post. If I have to add anything else here please tell me. Thanks. I'll try to go home now. It's raining again. Last week was Sportsfest Week. Didn't have classes except Thursday. Got sick. And umm yeah. Yesterday was the Cheer Dance competition. Ms. Verona interrupted the last performers to announce evacuation, told us to avoid stampede. Turned out the school was on fire. The rain was pouring hard. A storm. Hello Mr. Ondoy, can I say that you're the worse, ever? Oh no wait, Madam President is. Split up with the group. Got picked up by Yubi's parents. After a hundred detours we were able to reach their house safe. And wet. A few hours later we found out that Kat had to swim her way home, Audrey got stuck in Gateway but was going to spend the night in her friend Melissa's house, Apple (after a few hours at the LRT stations) went back to school (the Nursing building transformed into an evacuation center), Pat's still in her grandmother's burial, Reekha lost their house and car and jkdgf idk. And yeah. My room's in the basement. It became an underground pool. My family was able to save my computer but the rest of my things... I don't even want to think about it. I'm trying my best not to think that I'm attached to my material belongings. Right now the most important is that my family is safe. I'm still very lucky. Maybe not the luckiest, but still lucky. So, um guys. idk, instead of whining about trivial things, always remember that there are people who're having a harder time than you. Be thankful that you're still alive; that you still have your loved ones and your luxuries. Ironic how the rich people are the ones affected most by the typhoon. Trufax. I've never been this worried in my entire life. People have died. People are still dying.